Every day, 500 million tweets are sent and 300 million photos are uploaded to Facebook. Twitter, Facebook and other social media networks have radically altered the way we communicate with each other, including how we shop. Consumers now turn to their social media contacts to inform their buying habits. In fact, 81% of American consumers’ purchase decisions are influenced by their friends’ social media posts. This presents a great opportunity for marketers that are running customer referral programs to create programs that encourage social media sharing. This is the key to better advocate engagement and referral program ROI. But while customer referral programs and social media go together like mac 'n' cheese, success isn't guaranteed. That's why we've outlined five best practices to help ensure that your customer referral program is optimized for social media. Let's have a look. Why are social media and customer referral programs such a great combo? In a traditional email referral program, an advocate sends offers or purchase information out to their email contacts. That's great, but the potential for virality is pretty limited. 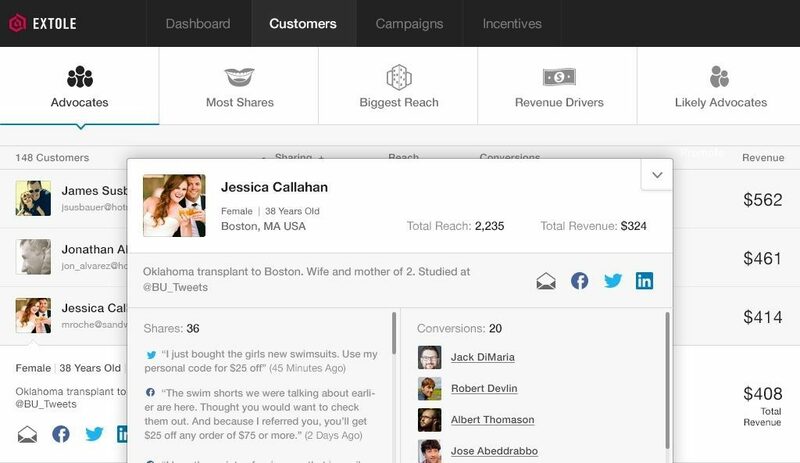 A customer referral program optimized for social media has more sharing potential built into it. Why? Because instead of prompting advocates to send individual emails to contacts, a social media referral program prompts advocates to share their purchase decisions with all of their contacts across all of their social networks. 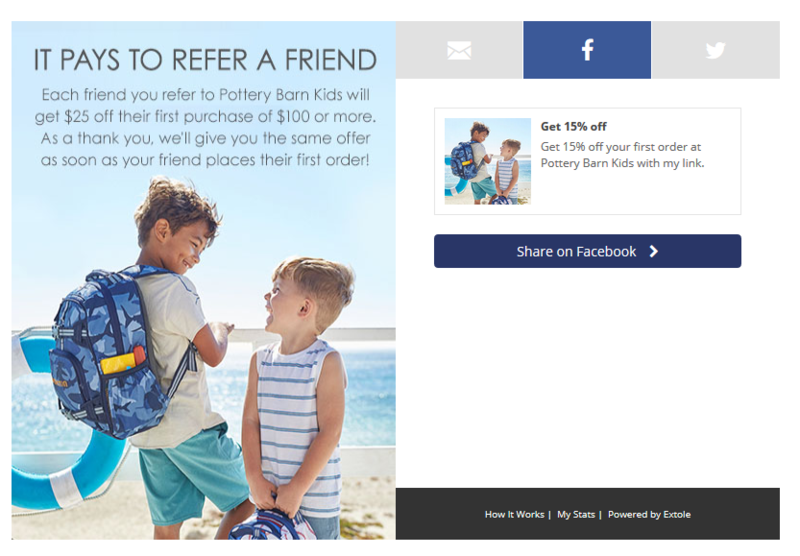 For example, advocates of the Pottery Barn Kids brand can share a referral on their Facebook page or Twitter feed. What's also great about sharing on social networks is that discount links, like the one in the example above, can easily be tracked back to the advocate. This lets marketers analyze how many referred customers follow-through and the overall success of the referral program. Social proof is the human urge to follow the crowd. Or as ConversionXL puts it, “people will conform in order to be liked by, similar to or accepted by the influencer (or society).” People are more likely to engage with and share content that comes from their trusted social media network. That means your customer referral program has a good chance of going viral among groups on social media because of the increased exposure. 86% of women will look at social media before making a purchase. 95% of millennials follow brands on social media, and 28% of the demographic say they won’t try a product without their friends’ approval. Customers spend between 20% and 40% more on brands that engage with them on social media. A referral program that works on social media means you can stop marketing 1-1 and start leveraging entire networks of potential customers. Successful referral programs don’t happen by magic. Sure, customers are doing the advocating on your behalf, but that doesn’t mean you can sit back and watch the referrals roll in. You need to take a strategic approach to social media to ensure that you get the most ROI from your customer referral program. Your customer referral program should be optimized for the social networks where advocates are most active and have the most engaged followers. This ensures your program will have maximum impact. Problem is, identifying those platforms for each individual advocate is time-consuming, particularly if you have to go to their social media accounts one by one and manually pull out the data you need. Platforms, like ours, help you automatically map out each advocate’s social media use patterns. Every time someone adds their email to your site — whether to place an order or refer a friend — social media data is automatically added to their user profile. You can then assess your advocate group for social media use trends and build referral programs around the platforms advocates use the most and that have the most engagement. Social media is built around personal interaction; generic promotional messages turn potential customers off. Your referral program should tap into social media’s capacity for conversation by personalizing sharing messages as much as possible. Personalized sharing messages for each advocate is a great way to avoid “bot fatigue” — the overuse of bots for customer communication — among social media users and boost the positive effects of social proof. We help users do this by building in-depth user profiles of each advocate, thereby equipping you with the data you need to personalize their messages. Advocate photos are a good place to start. Studies show that landing pages with human faces can achieve almost double the conversion rates of landing pages without faces; the same rings true for referral share messages. We found that adding a photo of the advocate to their share message increases conversion by up to 3%. We automatically add advocates' profile pics from social media to their referral messages so that recipients feel a stronger connection to the offer and the brand, as in this American Giant example. American Giant doesn't just personalize with an advocate picture; they even add the advocate's name to the discount code. Just seeing your friend’s name on the code can boost social proof. Discover more ways to make the most of your advocates here. Customer segmentation is vital in a social media referral program. 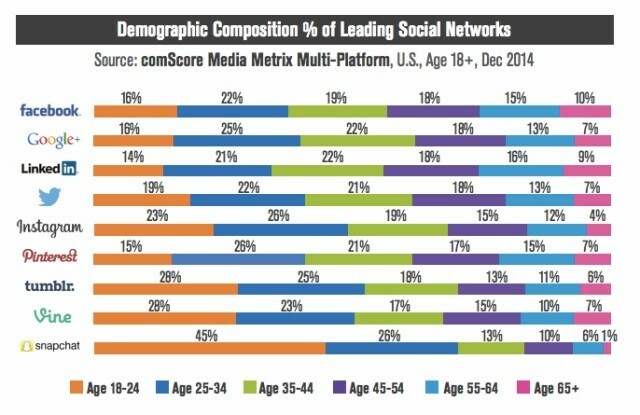 Different social media appeal to very different demographics as shown in the image below from Social Media Week, so you need to adapt messaging accordingly. This means that different social media networks have very different conventions around how you express yourself. You wouldn’t write on LinkedIn the same way you write on Snapchat. You need a referral platform that allows you to segment the target audience based on the social media network and refine sharing messages accordingly. 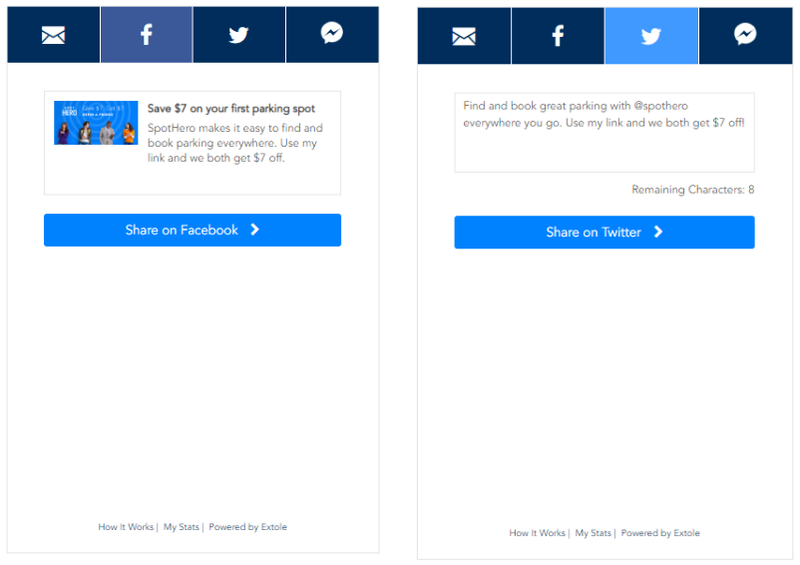 Our platform lets you segment campaigns based on the social media network and adapt sharing message content accordingly, like in this example from SpotHero. The two pre-generated share messages are adapted for their specific social media channel: the Facebook message sells a bit harder, with the $7 savings call out at the top, whereas the Twitter message feels more intimate. A sharing message adapted for each channel means advocates will be more comfortable sharing your brand offer. 61% of social media browsing happens on mobile. And 18% of customer referrals come from mobile devices. This means that any social media referral program needs to be optimized for mobile, period. 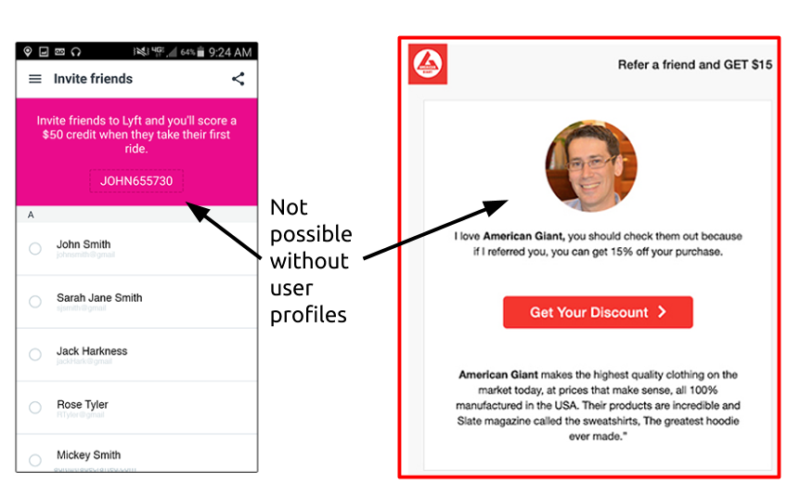 Optimizing your customer referral program for mobile means ensuring an intuitive user flow, keeping taps to a minimum, and generating pre-populated referral messages to reduce typing. 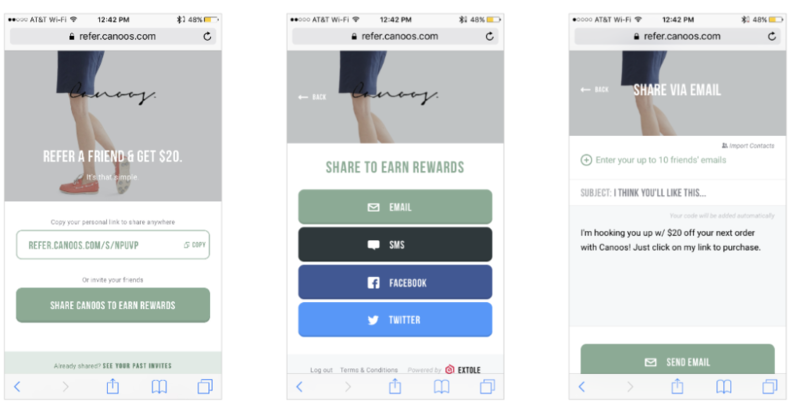 Canoos used our Mobile First templates to create a user flow, which users complete in just three screens, to share their referral program on Facebook and Twitter. 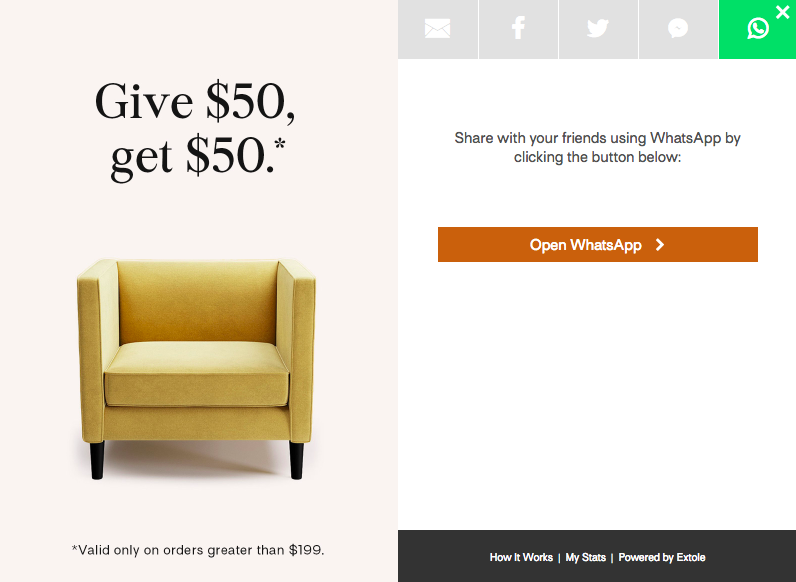 Advocates share their discount code in just three taps, no typing necessary. Plus the social media share buttons are right within the screen's “thumb zone,” meaning that they're comfortably within reach of the advocate's thumb. The less friction there is in the referral flow, the greater the share rate. Tweets with images get shared 2x more than those without images. And Facebook posts with images get 37% higher engagement than those without. Adding an eye-catching image to sharing messages will increase their visibility and success. But what makes for a great social media image? 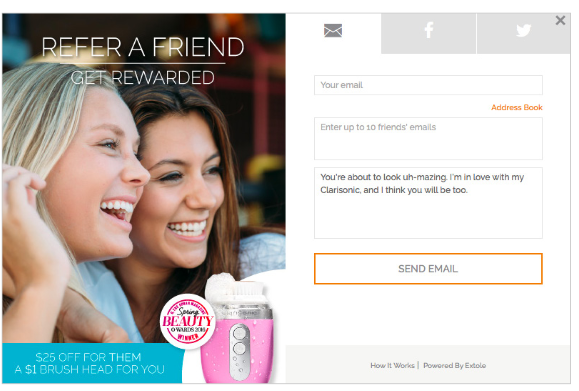 First, use an image with people looking towards the offer, just like Clarisonic did. Heatmaps show that CTAs like this have more clicks when the image shows people looking towards the offer rather than directly at the camera. If you sell a product, include a shot of it to let people know what to expect. And make sure your brand logo is big enough to be visible on social media timelines. This is especially helpful if you want to offer advocates another way to reach their family and friends in countries like India, Asia, and Mexico. For example, India and South Africa are the two largest markets for WhatsApp. India in particular makes up 10% of total global users of the app. Cater to advocates by offering them access to tools and platforms that make it easy for them to share your referral program — regardless of where they are in the world. Social media is one of the most powerful promotion channels for a referral program. But that doesn’t mean it’s easy to get right. Gradually incorporate each of the options we've shared to build customer referral programs that are optimized for social sharing from the get-go. Once you figure out a strategy that combines these best practices and leads to higher customer acquisition, you can focus on what really matters — building your brand.